NEW YORK (TheStreet) --When consensus opinion reaches an extreme, it is often wrong. We could very well be seeing that here regarding fears of the Federal Reserve tapering its quantitative easing (QE) this week and its supposed negative effect on emerging markets. All year long we've been hearing the same story, that any Fed tapering will disproportionally hurt the emerging markets as money will flow out of emerging countries in search of safer U.S. assets. Let's think this logic through, step by step. If tapering is supposedly disproportionately bad for emerging markets, then the endless quantitative easing over the past few years should have been disproportionately good for emerging markets. Not only has this not been the case, but the opposite has been true. 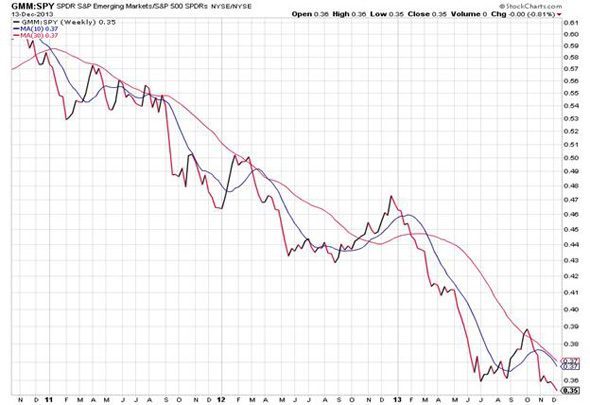 The chart below illustrates a price ratio of emerging markets -- as seen by the SPDR S&P Emerging Markets (GMM exchanged-traded fund -- to the S&P 500, as seen through the SPDR S&P 500 ETF Trust (SPY - Get Report). A declining ratio as we have seen over the past few years indicates that the numerator (emerging market equities) have significantly and consistently underperformed the denominator (S&P 500). As emerging markets have clearly not benefited from quantitative easing, then, why should we assume that a reduction or elimination of the program will have a deleterious effect? We should not, in my view. As Brazil's Central Bank Governor Alexandre Tombini said last week, quite the opposite may in fact be true. Tombini shocked the consensus in saying that the sooner the U.S. Federal Reserve begins tapering its bond-buying program, the better it would it be for the global economy and emerging market countries such as Brazil. When you think about the heart and soul of QE programs in the U.S. and Japan, currency depreciation or suppression, it becomes clear why this is the case. If the U.S. and Japan are benefiting from the depreciation or suppression of their currencies, then non-QE countries like Brazil should be hurting by an unwanted strengthening or bolstering of their own currencies. Such a strengthening has damaged exports in emerging markets to the benefit of U.S. and Japanese exports. While Japan has been more explicit in its desire to weaken the yen, outgoing Chairman Ben Bernanke and the U.S. Fed have been careful in avoiding the issue. But in a zero sum game of global trade, there is no escaping the reality of the situation, and in many respects 2013 has been the year of QE countries vs. non-QE countries in terms of market performance. If we do end up seeing a tapering then, either this week or in early 2014, an inverse logic should be applied. As it is clear the U.S. has been the primary beneficiary of the Federal Reserves policies, any reduction in Fed stimulus should disproportionately hurt U.S. equities. While many are saying U.S. equities could decline on a tapering, no one is suggesting that they will suffer a worse fate than emerging markets or that emerging market could outperform in that scenario. This is in large part due to recency bias as the U.S. markets have significantly outpaced emerging markets over the past three years. Our ATAC models used for managing our mutual funds and separate accounts are devoid of such bias and are currently favoring emerging market equities. Don't be surprised if in 2014 we see convergence between QE and non-QE market performance, especially if tapering begins.